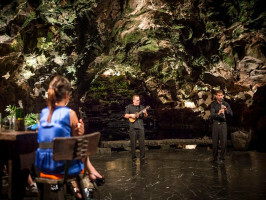 Delve deep into the marvellous mysteries that lie hidden within the volcanic tunnel created by the eruption of the Canary Volcano known as La Corona. 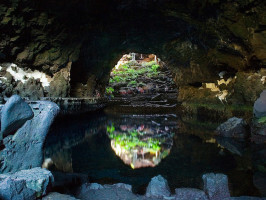 Within, you can come upon two breath-taking sights: on the one hand there is Los Jameos Del Agua and, on the other, La Cueva De Los Verdes, two otherworldly sites that will add a sense of adventure to your trip in the Canary islands. 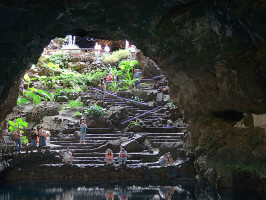 Los Jameos Del Agua is located in the section of the tunnel closest to the shore and it owes its name to the existence of an internal lake, which constitutes a singular geological formation originated from the filtration of water through the rock, located below sea-level. This one of a kind tunnel is one of the longest in the world, with a whole six kilometres of length. However, the partial collapse of the tunnel roof has formed a new structure now known in the island’s local tongue as “Jameo”, which refers to an opening in the ground. 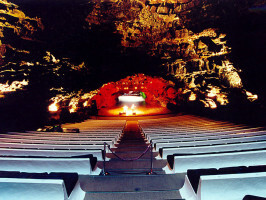 Through this opening, one can now access a series of underground grottoes. About six kilometres of the structure have been explored. These run from the crater of the volcano until it reaches the sea, where it continues underwater for a stretch of 1.5 kilometres. This other curious formation is called the Tunel De La Atlántida (“the Tunnel of Atlantis”). This limb of the volcano is formed by at least three “jameos”: Jameo Chico, which gives access to the interior; Jameo Grande; and Jameo Redondo. Restaurant - From 7pm to 11pm. Cocktail Bar - From 7pm to 12:30am. Tuesday night includes dinner and concert. 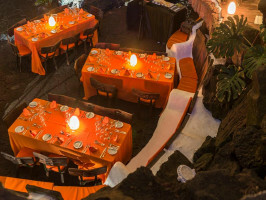 Saturday night includes concert and dinner “a la carte”. 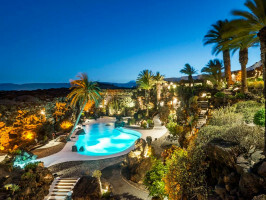 Live concerts at Jameos del Agua (by the lake) available every Tuesday and Saturday from 10:30pm (duration approximately 45 minutes) with Dj session until 12:30am. International cuisine with high quality local products. Fresh fruit juices and delicious tapas available at the Snack-Bar Galería. Menus for vegetarians and celiacs available. 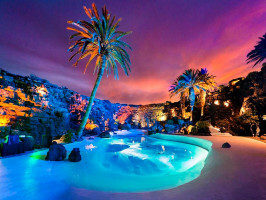 Exchange your voucher at Jameos del Agua. Redeem type: Printed Voucher. Print and bring the voucher to enjoy the activity. 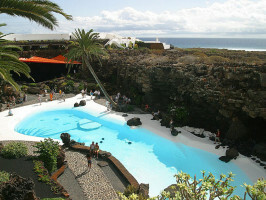 Meeting point: go to: Centros de Arte, Cultura y Turismo del Cabildo de Lanzarote Jameos del Agua. Duration: Approximately 4/5 hoursapprox. Start/opening time: Restaurant: from 7pm to 11pm. Cocktail Bar: from 7pm to 12:30am. 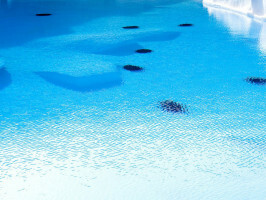 Opening days/period: Tuesdays / Wednesday (only in summer) and Saturdays. Others: Tuesday / Wednesday (only in summer) night includes dinner and concert, Saturday night includes concert and dinner “a la carte”. Menus for vegetarians and celiacs available. Children’s menu available. Remember to bring the voucher and valid photo ID with you. Should an emergency arise, please call at the next telephone number: +34 971 211601 - 24 hours (Languages spoken: Spanish, English). Classic Menu: First Course: Filo pastry mille-feuille stuffed with mushrooms, foie and prawns. Mandarin and lime sorbet. Main course: Salmon loin marinated in soy, sautéed spinach, raisins and pine-nuts on light cream of avocado and lime or Beef cheeks ,vegetables and sweet potato purée with vanilla flavor. Dessert: Chocolate ingot on custard. Premium Menu: Apetisers: Roasted seasonal vegetable shot served with slivers of Iberian cured ham. Startup: Canarian tuna ceviche, with tomato, avocado, mango and sprouts from Villa de Teguise. Sorbet: Mojito sorbet with strawberries. Land and Sea: Sama fish fillet served on a bed of sautéed vegetables, bonita potato puree, crispy beetroot and vanilla cream sauce or Glazed ox sirloin steak served with blueberries, garlic and rosemary parmentie, and boletus confit. A Sweet world: Cocoa dusted red berry dessert served with pineapple coulis. Bodega: Medium-dry white wine Grifo Blanco Collection or Carbonic Maceration Bermejo red wine. This menu includes a bottle of wine for two people, beer or soft drink, water and butter.